Be your own hero..Buy A Cape! 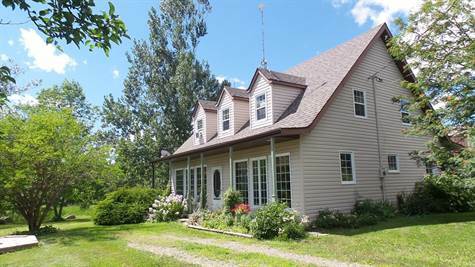 Surrounded by country bliss this custom built cape cod features 4.23 acres(+/-), so much room for farming, gardens & ponies! Enter through the mud rm then into a beautiful study that could also be a larger dining rm. Up a couple of steps to the living rm w/hardwood flrs & a private deck to enjoy! The dining area has large windows over-looking the flower gardens & the galley style kitchen makes dining in a breeze! A main floor bedrm or extend the kitchen & use a pantry? The possibilities are endless! Completing this level is a 2 pc powder rm. Upstairs boasts a huge master that we challenge you to fill with 3 closets & a private deck. A full bath with combined laundry area & 2 adorable guest bedrms complete this beauty! Outside the 24x40 2 storey garage with 17’ inside clearance could be the perfect barn or stable! Loving This New Listing & you will too!